Chess is one of the most renowned sports in the world. It is being played since 1000s of years now and even though there have been many modifications in the game over the years, the essence of the game is still intact. Chess enthusiasts live and breathe the game, actually. If you are friends with one of these enthusiasts, one of the best things you can gift them on any occasion is a sturdy marble and stone chess set. This is a Staunton Style chess set. It has been meticulously handcrafted into its beautiful form. Because of its raw marble nature, it is quite fragile. However, if you damage the set or the individual pieces in some way in 30 days or if you find that the product has arrived damaged, you can contact the customer care and have it replaced easily. The chess set arrives with a free storage box. It has a unique, intricate design. The King’s height is 3.5 inches while the dimensions of the board are 16X16 inches. The chess set weighs a total of 20 pounds. In the very first glance, I began to admire the sheer beauty of this chess set. It is very intricately designed; you can see the makers poured their heart into the design. It adds great aesthetic appeal to any room you decide to place it in. Let me take a moment to appreciate the impeccable customer care services offered by Radicaln. The set arrived with a couple of chipped pieces. I decided to avail their 30-day guarantee and contacted their customer care department. They did not waste any time in replacing the broken pieces with new, perfectly intact ones! Kudos to Radicaln for this. In spite of the fragility and the intricacy, I noticed that the set is very easy to play with. The pieces feel sturdy and weighted in my hands and make the game more enjoyable. You would benefit from spraying the set with a marble sealant. This is because the surface of the board can easily be scratched when you glide the pieces across it. One thing that does not fall in line with such a high-quality chess set is its casing. It is mainly cardboard and styrofoam. Overall the casing is quite flimsy and will not be able to hold the set in for too long. It should not come as a surprise that such a high-quality chess set is set at a fairly high price point. Even so, it is well worth the money. This is a Staunton Style, modernized chess set. This chess set has been intricately handcrafted. It is quite fragile because of the onyx marble material it is made of. If you damage any of the parts within 30 days or if the set arrives damaged, you can easily avail the 30 days guarantee and have the parts replaced with their excellent customer services. This set also comes with a storage box. It is colored green and white. The height of the King in this chess set is 3.5 inches and the dimensions of the board are 16×16 inches. The set weighs a total of 22 pounds. This set has a unique aesthetic appeal to it. The green and white colors contrast really well so you can distinguish the pieces easily in spite of both sides being light colored. It pops out especially well within the white décor of my drawing room. It would serve as a nice centerpiece in my study as well; if only my study was a bit lighter in color though! This set also has very solid and sturdy pieces which give you a feel for power when playing. It is quite enjoyable actually. Every piece is intricately designed and you can see that the quality of the set is above par. Even so, the set is quite fragile and you will need to be very careful when playing. It is best if you don’t place the board on a high table and as always, you should keep the delicate parts away from children! The casing of this chess set is nice and sturdy. You can pack it up and store it away if you don’t want it to tarnish. The set is very easy to play with without having a fear of the pieces breaking apart. This chess set is also quite expensive, but the sturdy and intricate make and the unique design make it a worthwhile purchase that can easily be passed down to generations! This chess set from Radicaln is also in the classic Staunton Style. This chess set is also carefully handcrafted. It is a fragile set but any damage seen or done within 30 days to the board or the pieces can be notified to Radicaln and you can get replacements. The color is the classic contrast between black and white. The design on the board and on the pieces is very intricate. It is a high-quality chess set. The height of the King in this chess set is 3.5 inches and the dimensions of the board are 16X16 inches. The set weighs a total of 15.42 pounds. This chess set comes without a case. I do believe you should, therefore, invest in a separate case since cases are invaluable for luxury items like this chess set. The black and white contrast of the set gives it a classic appeal. It will fit in easily with most color schemes in studies and libraries. The marble make adds to the aesthetic value and makes the set look very valuable. Overall, it is great as a centerpiece. It is a high-quality chess set and will amp up the aesthetic appeal of any room you place it in. This chess set will also make a valuable heirloom for your future generations. The pieces and the board itself may chip easily if you are not very careful with it. So try to not use it too roughly. The set is also quite fragile and the pieces will break if dropped from a height. The pieces in this set have a more matte than shiny look. For me, personally this was not a drawback since I measure this set as a centerpiece and I believe that centerpieces should pop out a little. The board is very smooth and the pieces glide over it effortlessly. There is also minimal scratching on the board’s surface. This set is a budget luxury item and is not quite as expensive as its aforementioned predecessors. What To Consider When Buying A Marble & Stone Chess Set? Marble and stone chess sets are not items that people purchase very often. This is why people don’t really know what to look for in a quality marble and stone chess set. If you relate to this problem, then knowing what to look for will help you make the right buying decision. First of all, consider the size of the set. You can buy a chess set ranging from life-sized to a miniature. The point of consideration is the space you have. If you plan on gifting the set to a friend, it is best if you have an idea of how they will store it so you can give one according to the space they have. 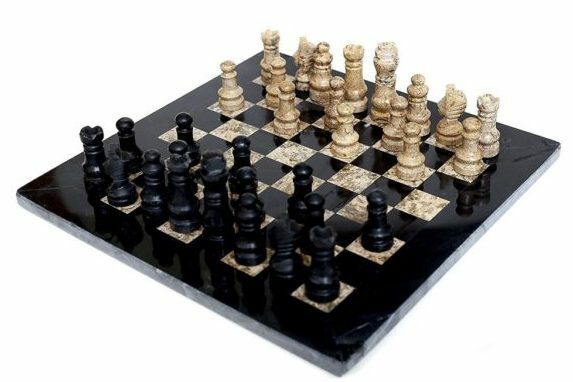 In case you are not aware of the space that they will set aside for the set, you can give them a standard-sized, coffee-table chessboard with the pieces to match. I’m not going to ask you to spend a fortune on a marble and stone chess set. You should set a budget for this luxury item and it is best to find one within your range. Even so, you should keep in mind that a marble and stone chess set is one of those things you usually only buy once in your life. It is one of those items that makes an heirloom and is sometimes passed down to the future generations of a family as well. This is why it makes sense to buy a high-quality one, to begin with. On a single glance, you probably cannot tell the difference between a factory-manufactured chess set and a handcrafted chess set, but this is because the beauty lies in the details. Handcrafted chess sets are intricately designed and perfected meticulously by hand. Naturally, they are also very expensive. If you can afford a handcrafted chess set, go for it. But don’t be disheartened if you can’t; factory made chess sets are also beautiful and durable nowadays. Every part of the original game of chess has evolved and has been modified in some way. But that does not mean that there is only one kind of set available in the market. The most commonly known chess set is one been used since the mid-1800s and that is the Staunton chess set. There are other types of chess sets that hold some historical value, like the Barleycorn Style set or other medieval styles. These sets will be useful for a collector but the most practical one remains the Staunton. The most common types of stone chess sets include ones that are made of marble or alabaster. Another very common material is onyx. Alabaster is the softest of these materials. The type of set you choose really depends on your own preference. There are many different types of stones that are used to make chess sets which are not commonly available. Some of these include jade and soapstone. The problem with these stone chess sets is that the pieces will break easily if dropped from a certain height. Though the material does not shatter, it does hamper the intricacies to some extent. If you are a collector or buying for a collector, you should know that the boxing of the set also holds significant value. Always know if the set is boxed or unboxed before buying it. Also, make sure you see if a case is included in the set. For a practical set, you will need to see if the case is carry-friendly. In a simply decorative set, make sure the case holds some aesthetic value and is a sturdy form of storage as well. For decorative chess sets, the color is also very important. It is best if you can make the colors contrast with the room where it will be kept. Other than that, make sure the pieces and the squares are also in good contrast with each other. This is where the classic black and white combination works best, but others work just as well if you have a good eye out for them. Radicaln 16 inches Large Black and Coral Fossil Chess Set- This set is easily the most beautiful one amongst the three. If you hold aesthetic appeal above all, you would be very happy with this one! Radicaln 16 Inches Large White and Green Onyx Chess Set- This Onyx set is the most unique amongst the three. This is because of the green and white contrast and the onyx make. Purchase this set if you want something different from the kinds of sets you usually see. 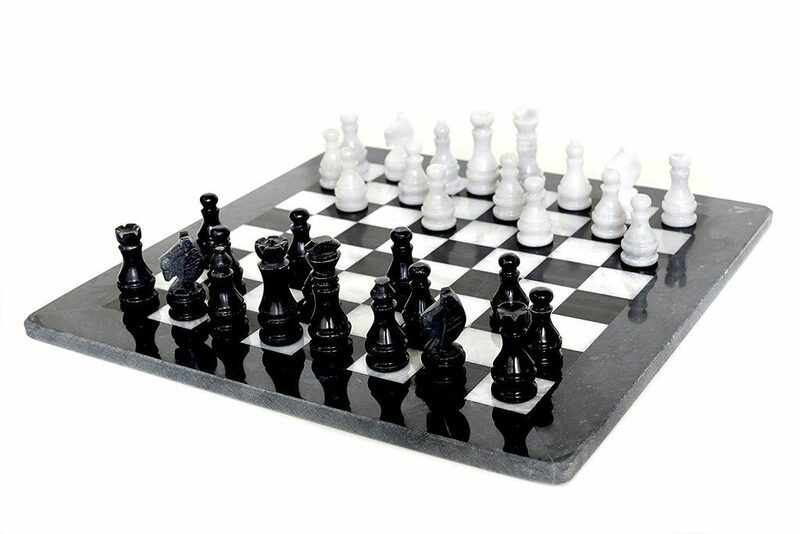 Radicaln 16 Inches Large White and Black Chess Set- This set is a high-quality budget item. If you do not have enough money for the previously mentioned sets then this one is for you. It is fairly beautiful as well and the pieces are intricately carved and solid, like any high-quality chess set. Any of these sets will fulfill your needs for a high-quality chess set. But even if you do not wish to buy one of these, you can at least make the selection process a tad easier by knowing what to look for!